People often ask me why I’m so passionate about books and education. I am usually shocked that more people aren’t. I have to keep in mind that not every one has had their life changed through education, and not everyone has had to fight tooth and nail for it. In my case, books have made the American Dream a reality. My parents were migrant workers. I’m the first of my family to not only go to college but to attend graduate school. In one generation - through books and education - my family has gone from the farm fields to the national stage, where I have had the honor of representing my community and advocating for Latino literature and history in our classrooms. I have a gift for language. I get it from my mom. She never went to school, but she taught herself how to read. She would keep all of our family spellbound when she told stories about her life in Mexico or in the fields, or about the misadventures of family members navigating their new life in Chicago. I knew language was powerful, because as early as third grade I was translating English into Spanish for my father. I remember salesmen looking down at him, judging him because he needed me to understand. That’s when I learned. I would remind a clerk that he didn’t speak Spanish, so he too needed me to make a sale. Language helped me protect my family. Language helped me defend myself. Maybe that’s why I always wanted to be a writer. My first poem was published in sith grade, over the lunch hot menu touting “Sloppy Joe Burgers” at St. David’s Catholic School on the south side of Chicago. Overnight, teachers who had ignored me knew my name and would walk up to me to talk about my writing. Same me, same school, different universe, all from one poem. You would think that with this love and fascination for reading and writing I would have been reveling in books by and about Mexican Americans. The truth is I was never exposed to them. I didn’t read a novel written by a Latino until I was a junior at De Paul University, taking a Creative Writing Course with Professor Ted Anton, a graduate of the University of Iowa’s Writers Workshop. He would ask me why I didn’t write about my family, my story. I remember wondering if that was even allowed since I had never seen that in a book. Professor Anton handed me "Down These Mean Streets" by Piri Tomas. That was the first book I read that switched back and forth from English to Spanish, to Spanglish to slang, then back, in a fast, furious and poetic pace. It was set in the rough urban sprawl of New York that looked and smelled like the South Side of Chicago. It was packed with crazy confrontations and barriers. If we can just survive the weekend, the book showed, we can get to school on Monday to keep fighting. Books are dangerous - and crucially important. They make us dream big and believe we can deliver. It worked for me. In 1994 I became the first Chicano to earn a Master of Fine Arts in Creative Writing at the University of Houston's Creative Writing Program. It was there I first met in person and chilled with a real life Chicano author, Dagoberto Gilb, when he had become the first Chicano to win the Pen/Faulkner prize as well as a ton of other awards that year. In 1998 my first novel "The Aztec Love God" was published. That same year I founded the group Nuestra Palabra: Latino Writers Having Their Say (NP), to promote Latino literature and foster literacy. NP would go on to host the release of Dagoberto’s book "Woodcuts of Women." But years later, in January of 2012, that book, along with Dagoberto’s book "Magic of Blood," were among the 84 works confiscated from classrooms in Tucson, Ariz., after Mexican American Studies had been prohibited in that state. That’s when I and other members of Nuestra Palabra first became Librotraficantes or book smugglers. 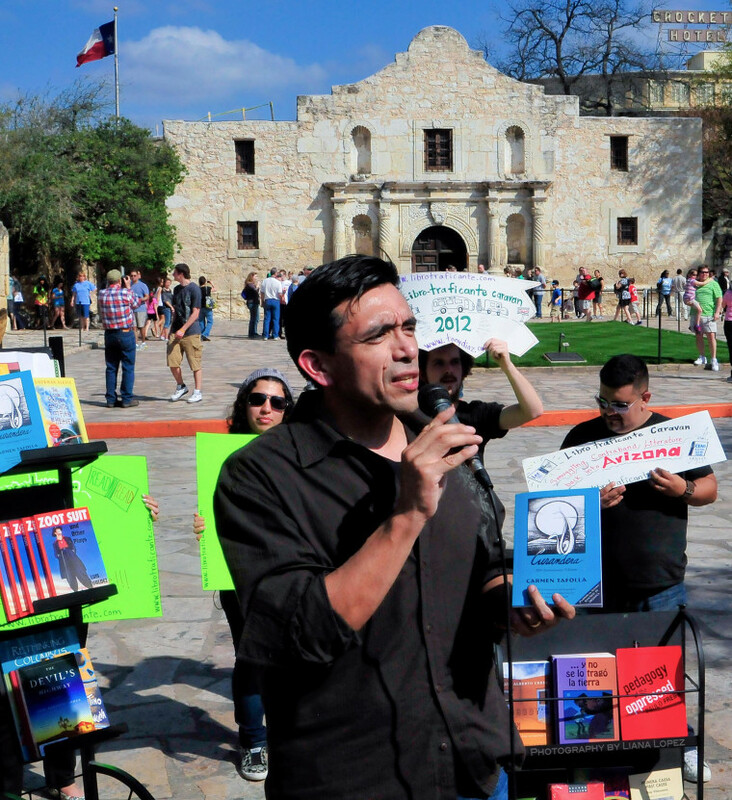 During our March 2012 Librotraficante Caravan we took banned books back into Arizona. This last week I was part of a statewide coalition that advocated for the Texas State Board of Education to implement a Mexican American studies elective to get more books into the hands of our youth. There were many who shared stories about what our literature and history has meant to them, and how it has changed their lives. And the first person to testify was - you guessed it - Dagoberto Gilb. We went to Austin looking to implement Mexican American Studies (M.A.S.) We came back with the Texas Plan that allows us to control the content of our courses, yet still have the courses recognized and advertised as electives by the state. It also allows us to get the textbooks needed for not just Mexican American Studies, but also African American, Asian, and Native American Studies. I see this event in Texas as part of a journey, a direct route from our underground libraries in community centers to the upper echelons of the textbook publishing world, with hundreds of stops in classrooms along the way. Why am I so passionate about education and books? Art changed my life. I believe that through broader imaginations, we can update the American Dream for everyone.